Introduction: An exquisite collection of Jewelry awaits you with this neckpiece.It is an elegant entwine design which is eye catching and sure to be a conversation starter each time you wear it.The materials used are glass, agate and alloy metal.This piece is crafted out of a combination of agate stones and glass beads in green color. These stones is wrapped in an antique brass metal wire which has attached with V-pattern loop chain which enhances the look of the piece. It has a lobster lock with a jump ring on one side of the piece. 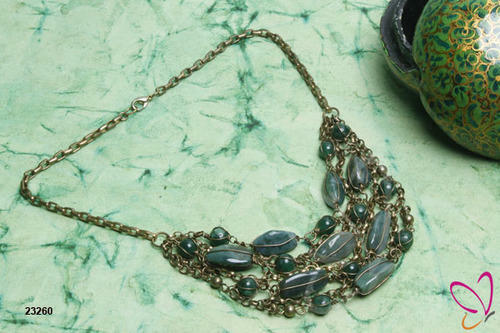 Style Tip: Wear this piece at a beach party and flaunt at its best. Dimension: Total length of the Necklace is 48 cm (18-7/8"). It has drop length of 29 cm (11-3/8). Delivery Time 45-60 days after received 30 % deposit. Packaging Details Packed in individual pollybag and then in corrugated cartons. Sangeeta Enterprises established in 2001, provide products of premier quality and exclusive designs which were symbols of Indian tradition. We are engaged in manufacturing, trading, supplying and exporting a wide range of Fashionable Jewelry such as Necklaces, Bracelets, Bangles and many more. Our company situated in New Delhi, India. The firm is already known for its classic jewellery. Our organization is proud to be offered range products our valuable clients. The ranged products are beautifully design, glossy, shine and in various sizes and shapes. Under the guidance of our mentor Mr. Raman Chanana (Partner) we provide all type of neck lines, bangles and other many more items. We are making full use of his extensive business experience ensuring a remarkable success in our business activities. Our mentor has made best promising use of his wide contacts which has helped us in making a broad network of huge clientele. Looking for export queries only.